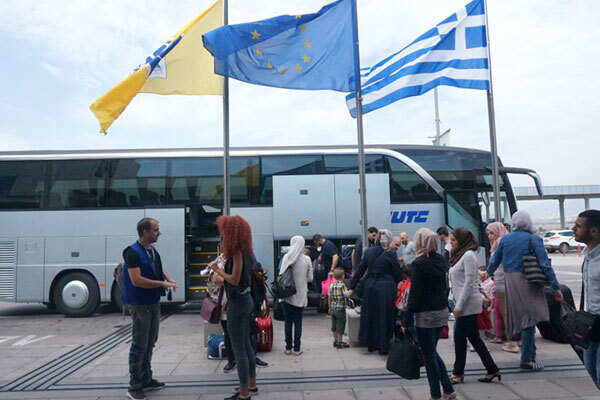 Greece - As the European Union (EU) relocation scheme reaches its one year anniversary, only 5,000 asylum seekers have been relocated from Greece and Italy to other EU Member States with IOM assistance. The EU programme adopted a year ago was set up to relocate 160,000 asylum seekers from frontline EU Member States. Since then, IOM has assisted 4,954 people relocate from Greece and Italy with pre-departure preparation and travel assistance. Given the slow progress made in the first year, IOM Director General William Lacy Swing has called on all EU Member States to step up and fully meet the commitments made under the programme. His comments come ahead of the 19 September UN Summit on Addressing Large Movements of Refugees and Migrants. “Relocation was put in place as a vital protection tool with the promise of a shared European response to the challenges of dealing with the migration flows across the Mediterranean. But we see that implementation is clearly lagging,” said Ambassador Swing. “If Europe is to seize the opportunity to make this programme work, it will need to keep up recent momentum and do much better in the coming year,” he added. With eight new relocation flights this week, a total of 3,797 people have now been relocated from Greece and another 1,157 from Italy. In September 2016 alone, IOM has relocated and booked relocations for more than 1,330 people from Greece and Italy to other Member States. This is over 25 percent of the total number of people relocated since the start of the scheme. While progress is clearly unsatisfactory when viewed against the plan’s target of 160,000 people, the number of relocations in recent months is rising and appears to be gaining momentum, Swing noted. Likewise, while the number of relocation places pledged by Member States is picking up, it remains critically low at 11,634, with almost 80 percent of these slated for relocation from Greece. Eugenio Ambrosi, Director of IOM’s Regional Office for the EU, Norway and Switzerland, said that faster and full implementation of the EU relocation plan is important because it will help to alleviate overcrowding, suffering and desperation among migrants and refugees in Greece and Italy. “It also reduces the chances that asylum seekers will give up waiting and resort to smugglers, which means more irregular migration. Relocation is an orderly and humane way of dealing with the pressures on people and states alike,” he said. For Fahad, a 27-year-old Syrian, relocating in Europe means safety and the chance for a new start in France, possibly in the fashion industry. “I didn’t go to college, I finished school and for the last eight years I was working in fashion. France loves fashion. I hope to find a good job. Working is not only good for me, it is also good for France,” he said. It also promises an environment of more tolerance for his sexual orientation. “I am here in Greece with my boyfriend. In Syria we were facing big troubles, but I know in Europe I am safe. I already feel more secure,” he said. Fahad left Latakia one year ago due to the war. His journey lasted three months. He left Syria and first went to Lebanon, then to Turkey, and finally to the Greek island of Samos. “I was on a boat that transferred us from Turkey to the Greek islands. After reaching Samos, I went to Eidomeni on the mainland for a month and then to Thessaloniki. Now I am in Athens waiting for my flight to France to start a new life. I am very happy,” he said, before leaving Greece. As of 31 August, 57 percent of all beneficiaries of the programme were Syrian nationals. Eritreans and Iraqis were the second and third largest groups. Some 62 percent of the beneficiaries are male and 38 percent female. A third of all beneficiaries were children under 18 years old. Only 52 unaccompanied children have so far benefitted from relocation to another EU Member State. France (1,662), Finland (679) and the Netherlands (617) have received the most asylum seekers to date under the scheme. IOM provides pre-departure health checks, cultural orientation and movement assistance to help prepare people and to ensure that they reach their destination safely and with dignity.